Concrete block making industry is a potential business for Bangladesh since government of Bangladesh is going to ban the use and production of red clay brick in this country. To protect environment, the government of Bangladesh is taking steps to stop production of clay bricks using surface of earth. So, the construction works should be done by using alternative building blocks like concrete blocks. 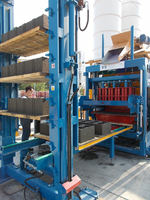 CBECL GROUP is providing technology and consultation on concrete block making machinery in Bangladesh.